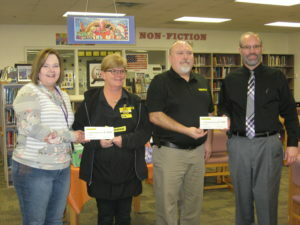 As part of the Dollar General “Thanks Giving” Campaign and their mission of Serving Others and giving back to the community, Dollar General representatives Marcie Henry (Holdrege Manager), Ed Haverluck (District Manager), and Daren Malesker present Holdrege Middle and High School with checks for $5,000.00 each to support library and literacy initiatives that best support education. The Dollar General Literacy Foundation is proudly celebrating 25 years of Serving Others. Since it’s inception in 1993, the Foundation has awarded more than $160 million to literacy efforts that have helped more than 10 million individuals. Receiving the award for Holdrege High School is Principal, Bob Drews. 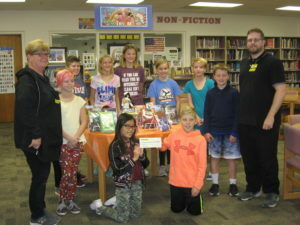 Accepting the award for Holdrege Middle School is Principal, Angie Girard, along with the top 10 middle school Accelerated Readers for Quarter 1. 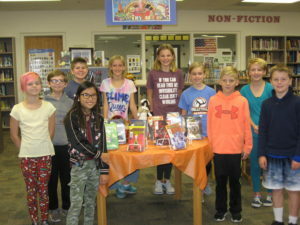 The top 10 readers are: Charli Wells, Jordan Knoell, Lillian Janssen, Dominic Deaver, Derrek Marquardt. Kendellen Kellen, Hailey Cepel, Titus Epp, Averie Thomas and Ellie Pelster. 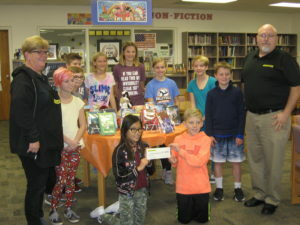 Thank you, Dollar General, for your generous contribution and for supporting literacy and education in our community!